MySQLBackupFTP connects to MySQL through TCP/IP, SSH or phpMyAdmin, runs scheduled backups, zips and encrypts the backups, stores them on a network or on a FTP server, removes old backups, sends an e-mail confirmation on job's success or failure. vPerformer is a web performance and load testing tool that can be used to assess the performance and scalability of your web applications. vPerformer allows you to evaluate the response of your web application when it is concurrently accessed by a large number of concurrent virtual users. These virtual users can be run either on your own servers or in the cloud. Fast text manipulation and data extraction. Fix websites, database data and electronic text with pattern match, convert end of line characters, ANSI and Unicode maps, add or remove lines and columns, apply formatting, add line numbers, sort, split, join, restrict filters to line/column ranges, CSV or tab-delimited field ranges and much more! Winner of SIA "Best Application" award. "A text processing utility on steroids"-Win2000 Tips. 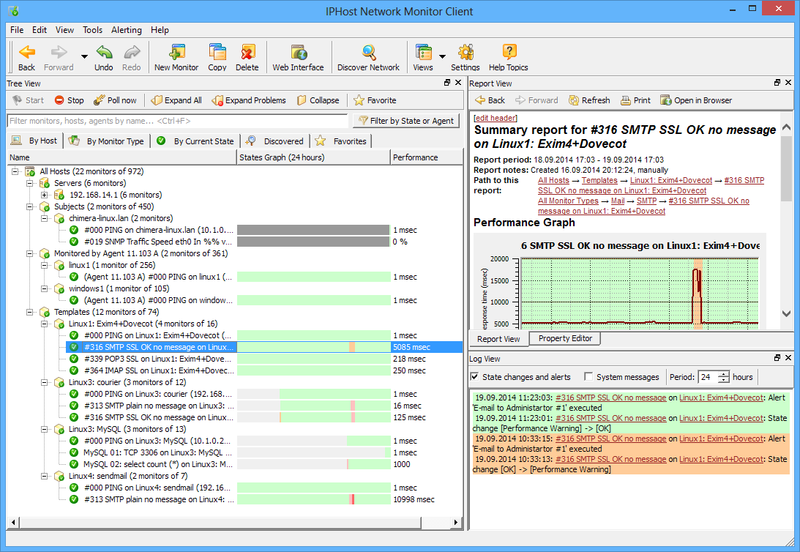 IPHost Network Monitor is a distributed network and server monitoring software for tracking of performance and availability of mail, db and other servers, web/intranet sites/applications, network equipment via SNMP (UNIX/Linux/Mac) and WMI (Windows), HTTP(S), Oracle, MySQL, MS SQL, ODBC, FTP, SMTP, POP3, IMAP, PING &amp; more. Custom scripts or programs as monitors, including Nagios plugins. SNMP MIB browser. Admin tools. Regular reports by email. IP2Location IP-COUNTRY-REGION-CITY-LATITUDE-LONGITUDE-ZIPCODE-TIMEZONE-ISP-DOMAIN-NETSPEED-AREACODE-WEATHER is commercial lookup database that translates IP address to country, region, city, latitude, longitude, ZIP code, time zone, ISP, domain name, connection speed, IDD code, area code, weather station code and station name. Database updated monthly to support latest changes in IP address re-assignment. All subscribers can access to the monthly updates from our server. Regardless of whether you are maintaining a complex corporate web site or running a personal blog, the HTTP Debugger Pro will assist you in locating the web site errors and identifying slow performing web pages. It will help to calculate the execution time of your server side scripts; analyze the http headers, query strings, redirections and authorization data; view submitted forms, POST parameters and cookies; analyze the http traffic from web browsers and add-ons, ActiveX components and Java applets; and see the web site dynamics in easy to understand form of charts and diagrams. Website Monitoring Software to monitor the status and performance of multiple web sites. Tests and monitors 3 critical factors to insure a website is responding and functional. Tracks server response using Active Ping technology, verifies DNS resolution and monitors HTTP visibility. Watch response trends displayed graphically and be notified immediately by email or alarm if your site fails or responds slowly. Monitor Wolf can contact you immediately when a problem occurs so you know what is happening in real time. AdmWin is a toolkit for the Windows, Linux and Novell network administrator. Batch manage accounts, passwords and settings. Transfer accounts and passwords between different platforms. Create or manage accounts on many platforms at once. Explore accounts. Collect system information and event log records from Windows machines. View remote Windows services and processes. Manage remote Windows machines with the remote command prompt. Load Testing Tool for Web Applications. Simulates users to answer these questions: how many users does my site handle? Will my site crash under load? What are the response times? Easy to use, no scripting but can design advanced scenarios.